United Nations, United States | AFP | The US has accused North Korea of “begging for war” and pushed for the “strongest possible measures” on Pyongyang following its sixth and most powerful nuclear test. As world powers scramble to react to the latest grave step in the North’s rogue weapons programme, South Korea launched major live-fire naval drills to warn its isolated neighbour against any provocations at sea Tuesday morning local time. US Ambassador Nikki Haley told an emergency meeting of the UN Security Council that Washington will present a new sanctions resolution to be negotiated in the coming days, with a view to voting on it next Monday. “Only the strongest sanctions will enable us to resolve this problem through diplomacy,” Haley told the meeting Monday called by the United States, Britain, France, Japan and South Korea. North Korea on Sunday triggered global alarm when it detonated what it described as a hydrogen bomb designed for a long-range missile. The underground blast had a yield of between 50 and 100 kilotons, or on average more than five times more powerful than the bomb detonated over Hiroshima, UN political affairs chief Jeffrey Feltman told the council. Declaring that “enough is enough,” Haley said incremental sanctions imposed on Pyongyang since 2006 had failed. Leader Kim Jong-Un’s “abusive use of missiles and his nuclear threats show that he is begging for war,” she said. “War is never something the United States wants and we don’t want it now, but our country’s patience is not unlimited,” she said. Haley did not spell out what measures Washington was seeking, but diplomats said they could target oil supplies to North Korea — potentially dealing a major blow to the economy. New sanctions could also seek to curb tourism to the country and ban North Korean laborers sent abroad. The draft text was expected to be presented to the 14 other council members on Tuesday as the United States sought to respond quickly to reports that North Korea was preparing another missile launch. Pyongyang in July fired two intercontinental ballistic missiles (ICBMs) that apparently brought much of the US mainland into range and Seoul has said it could be planning another test. At the UN, China’s ambassador Liu Jieyi warned that the crisis was worsening and emphasized the need for dialogue and a diplomatic solution. “China will never allow chaos and war on the (Korean) peninsula,” he asserted. 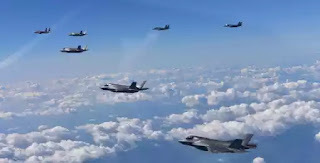 Liu urged the parties to agree to a Chinese-Russian plan calling for the North to freeze its missile and nuclear tests and the United States and South Korea to suspend joint military exercises. “When a rogue regime has a nuclear weapon and an ICBM pointed at you, you do not take steps to lower your guard. No one would do that. We certainly won’t,” she declared. Russia said it would study the new US proposals for sanctions, but again stressed those measures alone would not resolve the crisis. “This is not the way to get parties to the table to seek a political solution,” said Russian Ambassador Vassily Nebenzia. The council has imposed seven sets of sanctions on North Korea since it first tested a nuclear device in 2006, but Pyongyang has repeatedly found ways to circumvent the measures. The most recent resolutions, however, have zeroed in on the economy, targeting key exports sectors such as coal that are a source of hard currency for the regime. Haley reiterated US threats to impose sanctions on countries that conduct trade with North Korea, saying these nations will be seen as “giving aid to their reckless and dangerous nuclear intentions”. That could have major reverberations: China is the largest trading partner of both the North and the United States. South Korea’s defense ministry said it was already strengthening its defenses, in part by deploying more US-made Terminal High-Altitude Area Defense (THAAD) missile launchers. The South carried out an early-morning volley of ballistic missiles Monday simulated an attack on the North’s nuclear test site, followed Tuesday by the naval drills. US President Donald Trump and South Korean leader Moon Jae-In spoke on the phone Monday and agreed to remove limits on the payload of the South’s missiles, fixed at 500 kilograms according to a 2001 bilateral agreement. Trump also approved in principle, the sale of “many billions of dollars’ worth of military weapons and equipment from the United States by South Korea,” according to a White House readout of the call which did not mention any specific new deals. 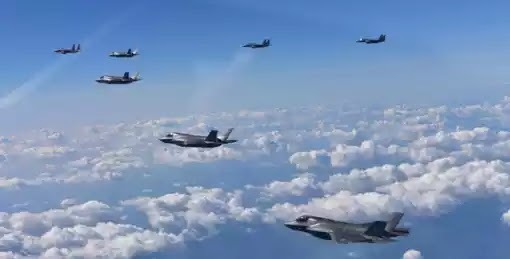 Seoul was the fourth-biggest importer of US arms between 2010-2016, purchasing nearly $5 billion of weaponry in that period according to an analysis by the Stockholm International Peace Research Institute. On Sunday US monitors measured a powerful 6.3-magnitude earthquake near the North’s main testing site. Hours before the test, the North released images of Kim inspecting a device it called a “thermonuclear weapon with super explosive power” entirely made “by our own efforts and technology”. The South’s defence minister said Seoul believed the North had succeeded in miniaturising a bomb to fit into a missile.